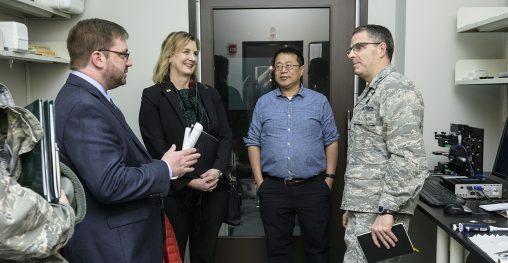 Senior leaders from the Air Force Research Laboratory came to Wright State University to discuss how to strengthen and expand partnerships as the Air Force works to remain on the cutting edge of technology research. The meeting with top Wright State administrators and deans from the colleges was held Feb. 6 at the Neuroscience Engineering Collaboration Building. AFRL, located at Wright-Patterson Air Force Base, is a scientific research organization dedicated to the discovery and development of aerospace warfighting technologies. It controls the Air Force’s science and technology research budget. Wright State President Cheryl B. Schrader welcomed the AFRL contingent, saying she was thrilled to discuss outreach opportunities and partnership efforts that could benefit the region and Ohio. “I very much value having leadership teams come together across organizations to make sure that we are being the best partners we can be and are aligning in a way that really brings a lot of strength to what we do,” she said. Schrader noted that there are large workforce needs in the region in the STEM and health-related areas and that Wright State currently has strong research partnerships with the military, industry and health care providers. Last year, she said, the university posted nearly $100 million in research and sponsored programs. Maj. Gen. William Cooley, commander of AFRL, said there is a renewed emphasis from the Pentagon on science and technology and how to maintain the military’s technical advantage. AFRL officials toured the labs at Wright State’s Neuroscience Engineering Collaboration Building. 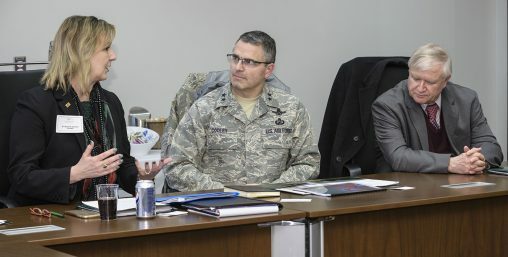 From left: Jason Deibel, chair of the Department of Physics; Wright State President Cheryl B. Schrader; Weidong Zhang, research physicist; and Maj. Gen. William Cooley, commander of the Air Force Research Laboratory. Cooley said that in the current research environment of modern industry, there is an emphasis on the use of computer software, quick returns on investment and pursuit of game-changing technologies. He said AFRL would like to leverage its existing relationships to evolve into a 21st century laboratory ecosystem. Schrader said the Wright State Research Institute could help be the “velocity piece” that translates research more rapidly into the field. The Wright State deans shared research projects and programs they have worked on with AFRL and what their colleges can offer. The discussions touched on trauma medical training, commercialization of technologies and entrepreneurship, virtual reality, workforce development, human performance, sensors, cybersecurity, data computing, economic development analysis, aviation psychology and unmanned aerial systems. Jack Blackhurst, executive director of AFRL, provided the Wright State group with contact information and told them how they can identify research and partnership opportunities with AFRL online. The AFRL officials were later given a tour of some labs and research projects at the Neuroscience Engineering Collaboration Building. Cooley said AFRL would be open to directly work with Wright State scientists on the campus, possibly in available space at the NEC. Attending the meeting for Wright State were Schrader; Walt Branson, vice president for finance and operations and chief business officer; Margaret Dunn, dean, Boonshoft School of Medicine; Joseph Keferl, dean, College of Education and Human Services; Nathan Klingbeil, dean, College of Engineering and Computer Science; Linda Caron, dean, College of Liberal Arts; Deborah Ulrich, interim dean, College of Nursing and Health; Thomas Traynor, dean, Raj Soin College of Business; LaPearl Winfrey, dean, School of Professional Psychology; Douglas Leaman, dean, College of Science and Mathematics; Ellen Reinsch Friese, interim vice president for research; Dennis Andersh, executive director, Wright State Research Institute; and Timothy Broderick, associate dean for research, Boonshoft School of Medicine, and chief science officer, Wright State Research Institute.